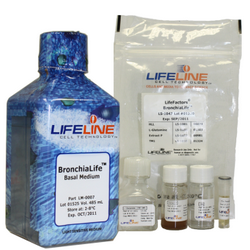 BronchiaLife™ Cell Culture Medium Complete Kit is optimized for the serum-free culture of Human Airway Epithelial Cells, including Bronchial/Tracheal, Small Airway, and Lobar Bronchial Epithelial Cells. BronchiaLife™ supports the growth of these cells over a period of at least 15 population doublings. BronchiaLife™ Basal Medium contains no antimicrobials and no phenol red. Lifeline® offers antimicrobials and phenol red, but they are not required for eukaryotic cell proliferation. Kit format for formulation flexibility. Offered in a kit format composed of basal medium and associated supplements and growth factors called LifeFactors®. This kit allows you to prepare fresh medium in your laboratory, extending shelf life and enhancing performance. Protective packaging. BronchiaLife™ Basal Medium is provided in a light-protected 500 mL bottle. The remaining LifeFactors®(growth factors and supplements) are packaged in a convenient gas-impermeable pouch for easy storage.